Janet was at the end of her third 12-hour night shift when it happened. She was giving the morning insulin at 4 am, as she had done so many times in her 3 years at the prison. This time, however, she drew up and administered regular insulin instead of NPH to Inmate Russo. The error wasn’t discovered until after he had passed out in the chow line. Although he recovered with glucagon administration and had no permanent injury, Janet was devastated by the error and is questioning her nursing abilities. Correctional nurses work hard…and long…with many schedules based on 12 hour shifts. Considering the transit time it can take to get to a remote prison location and the effort to pass through security and various sally ports, longer shifts seem practical. 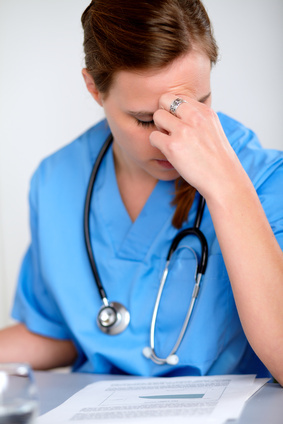 However, research is growing to indicate that nurse fatigue can have a detrimental effect on patient safety. Research on the effects of nurse fatigue indicate that nurses working more than 12 hours a day are three times more likely to make a patient care error. Additional research into nurse fatigue confirms that long shift length increases error, close calls, and decreased vigilance. This later finding can have particular application in the correctional setting where nurses must be vigilant, not only for patient safety but also their own safety in a secure setting. A study of shift workers found that risk of accident escalated over time so that the risk of accident was 17% higher on the fourth straight night of shift work. Education: Many nurses are unaware of the degree to which lack of sleep affects performance. We can start by being educated about the issue. Sleep Hygiene: Just like our patients, we, too, need to have good sleep habits for our health and for patient safety. Having a regular bedtime, getting at least 7 hours of sleep, and avoiding alcohol or caffeine near bedtime can help. Organizational Culture: Organizations can set limits on the number of shifts and hours worked by nursing staff. Nurses can feel pressure to fill empty shifts to assist workmates or meet management expectations. This pressure should be withdrawn and other measures sought to meet staffing needs. System Checks: Consider staff fatigue when performing root cause analysis for quality improvement purposes. Implement second check processes for critical tasks to overcome fatigue-related error potential. Many traditional health care settings require a second check on insulin administration like the one in our case study.